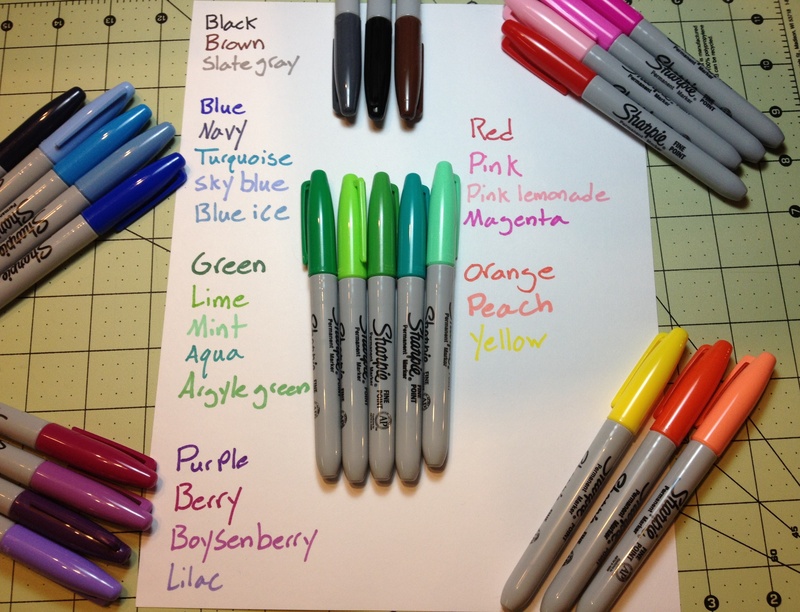 Now I’m on the third part of my look at all of the Sharpie colors that I have. I’m not sure I need to introduce the color green to you, so I’ll just get into it. 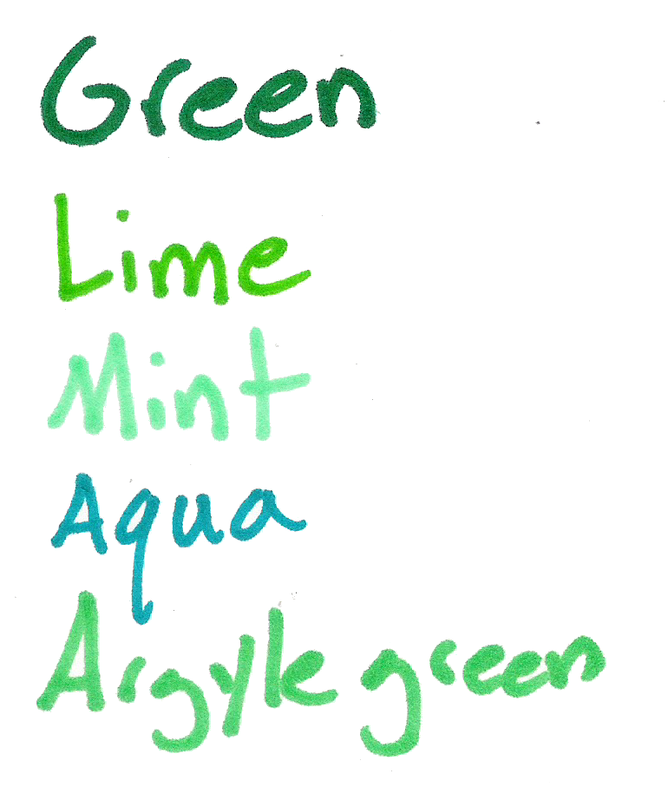 Green – This green is a very dark color, even more so than the standard green color most art supplies feature. It’s a deep, leafy green that is quite natural but does look generically dark in bad lighting. On copy paper, it can be hard to distinguish for people with bad eyes. It’s also quite bleed- and feathering-prone, but on less absorbent papers all three of the last points are minimized. It’s a good generic color, but far from my favorite of the selection. Lime Green – The lime green is a variety of lime that isn’t an eyesore and looks sufficiently like the fruit to justify the name. It’s bleed- and shade-prone, but isn’t too bad on feathering. It is a very visible, not too bright to read, not too dark, and not too close to the standard green, making it good for organizing. It’s finally a lime color I would use. Mint – The mint is more akin to ‘mint flavored’ than to the plant. It’s a very frosty, light green. It is still not too light to read, and is very distinguishable from the other colors. It’s also a fairly natural shade, so it works for art as well as the office, though this might be a bit extreme for some offices. It’s less bleed- and shade-prone than most of the greens, but the most susceptible to shading. Aqua – Aqua is a nice dark blue-green color. I’d say it leans more to the green side myself, while the turquoise leans more to the blue (which is the opposite of real life). Still it is a very natural shade for both water and land. It is a darker green, but not one that I think would be confused with any other color, but it might be a bit out there for office use. It also has the least shading, feathering, or bleeding of any of the greens. Argyle Green – This is the second and final color that I am dubious of my identification of. If you think I’m wrong, feel free to correct me in the comments. Argyle is a medium green very similar to the lime color but a bit darker. It’s got some bleed-through and feathering problems, but minimal shading. Other than that, I’d say it mimics lime well on the page: it has similar organizational and artistic properties, and would be hard to distinguish at a glance. It’s just not very original. And that’s my look at the green selection of Sharpies I have collected. They are all very good for organization and artistic efforts, but they may stick out or be frowned upon in the office. They behave all right in terms of properties, but they aren’t the best in that regard. But I think they might be my favorite set. Next time I’ll take a look at a collection of purple pens.